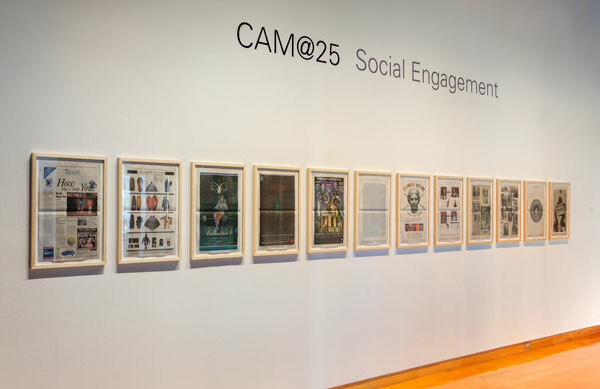 The USF Contemporary Art Museum celebrates its 25th anniversary with CAM@25: Social Engagement to highlight its history of bringing artists, and the practice of making contemporary art, to the Tampa Bay community. This selection of installations serves to mark CAM’s extensive history of exhibitions, commissions and collaborations with artists whose practices and projects embrace an ethos of responsible social meaning, purpose and motivation in the public sphere. Artists include Los Carpinteros, Pedro Reyes (Mexico), and Janaina Tschäpe (Brazil/Germany). Los Carpinteros (Havana/Madrid) have collaborated with the USF Institute for Research in Art for nearly a decade, producing two and three-dimensional works while in residence at Graphicstudio as well as the exhibition Inventing the World, organized by CAM in 2005. For Social Engagement, CAM will reveal Los Carpinteros’ newly conserved and fabricated work, Transportable City, 2000. This seminal installation from USFCAM’s collection will be sited outdoors on grounds surrounding the Museum and illuminated at night. Ten three-quarter scale canvas structures—Apartment Building, Capitol, Church, Factory, Hospital, Lighthouse, Military, Prison, University, and Warehouse—are representative of everyday buildings that compose a larger whole. In addition, Conga Irreversible, a 2013 video, will be projected inside the Museum. Imagine, 2012, a sculptural installation by Pedro Reyes, is a social/political statement on contemporary society and our responsibilities toward it. His projects serve as catalysts for communal and psychological transformation, encouraging group interaction and creativity, and poignant reminders of the consequences of inaction and apathy. The installation includes musical instruments created from firearms—including revolvers, shotguns and machine guns—crushed by tanks and steamrollers to render them useless. These were offered to the artist by the Mexican government following their confiscation and subsequent public destruction in the city of Ciudad Juarez. Reyes will be in residence at CAM to participate in a live performance of the instruments in conjunction with a Legislative Theatre Workshop with students from the community and from USF Theatre/Dance and Music. Janaina Tschäpe returns to CAM with a new configuration of her video installation Blood, Sea, commissioned by USFCAM in 2004 and filmed at Florida's Weeki Wachee Springs. Tschäpe is a prolific mixed media artist with an international presence whose work blends mythology—evoked by the mermaids of Blood, Sea—with other spiritual and cultural influences from her complex German-Brazillian heritage. For CAM@25, Tschäpe will also create a new mixed media installation that includes sections from templates used in the print editions she has developed while in residence at Graphicstudio. Art in the News, installed in the Genevieve Lykes Dimmitt Lobby Gallery for CAM@25, was a yearlong exhibition of artworks conceived for the context of a daily newspaper. Demonstrating CAM’s commitment to social engagement, Art in the News took the form of a full newspaper page designed by an artist in consultation with CAM staff, and distributed via The Tampa Tribune to 330,000 subscribers once per month on Sundays during 1999. Following each publication, the artist traveled to Tampa to give a public presentation about his or her work at the Tampa Museum of Art. The project featured, in order of publication, artists William Wegman, Lucy Orta, Matthew Barney, Leslie Lerner, The Art Guys, Allan McCollum, Ed Paschke, Andrea Zittel, Keith Edmier, Lorna Simpson, Mariko Mori and Mark Mothersbaugh. In 2000, the Museum of Modern Art (MoMA), New York, acquired Art in the News for its permanent collection. CAM@25 is supported in part by a grant from the Arts Council of Hillsborough County and the Board of Hillsborough County Commissioners, and ARTE: Tampa Bay’s Festival of the Americas. Conservation of the Los Carpinteros project generously provided by the Knox Family Foundation. The Pedro Reyes project is supported in part by a grant from the USF College of The Arts (Funding generously provided by the Arnold and Louise Kotler Memorial Endowment and the Macy’s Distinguished Artist Fund). Energy efficient lighting in USFCAM galleries is made possible in part by a grant from the USF Student Green Energy Fund (SGEF).